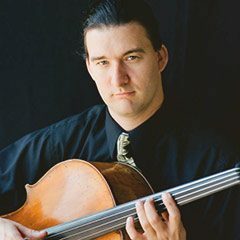 William Skeen serves as principal cellist of the American Bach Soloists, Seattle Baroque orchestra, Los Angeles Baroque Orchestra, Los Angeles Bach Society, and Musica Angelica Baroque orchestra. William has also appeared with El Mundo, the Carmel Bach Festival, Voxfire, Hesperus, Baroque Northwest, and Just Strings, a microtonal ensemble. He earned degrees in performance from the Cleveland Institute of Music and USC’s Thornton School of Music, where he now teaches baroque cello and viola da gamba.